Methuen Drama, 2002 Mathuen Student Editions series. Translation by J.Michael Walton. Introduction and notes by Marianne Macdonald " Wronged and discarded by her husband, Medea gradually reveals her revenge in its increasing horror, while the audience is led to understand the incomprehensible. This Student Edition contains a full introduction, commentary and questions for study". 1st UK Edition.. Softcover. New. A bold new translation of this shockingly modern classic work by Forward Prize-winning poet, Robin Robertson.Medea has been abandoned by her husband. Jason, for whom she has sacrificed so much, has left her and their two children for a younger woman. His new bride is the daughter of the most powerful man in Corinth and Medea and the boys are to be forced to leave the state and become refugees. 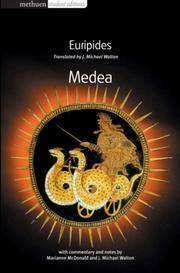 But Medea is not a woman to accept such disrespect passively. Strong-willed and fiercely intelligent, she turns her formidable energies to working out the greatest, and most horrifying, revenge possible on those who have injured her. Euripides' devastating tragedy is shockingly modern in the sharp psychological exploration of the characters and the gripping interactions between them. Award-winning poet, Robin Robertson, has captured both the pace and vitality of the drama and the power and beauty of the poetry and has reinvigorated this masterpiece for the twenty-first century.